The Community Futures Thompson Country regional Junior Dragons’ Den took place last Thursday, permitting a selected few aspiring student entrepreneurs of different age groups to present their business ideas to a live audience and judging panel. The competition was separated into three divisions, a junior category for elementary school students, a secondary category for junior high/high school students and a post-secondary category for university students. The three winning concepts (one for each age group) were rewarded a $500 check to continue pursuing their venture. Out of 400 business proposals, the 16 most fleshed out student entrepreneurial projects qualified to compete. 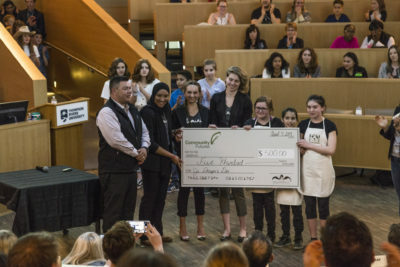 Each competing qualifying team was paired up with a mentor from the Kamloops business community to help further develop the students’ business idea while assisting them in composing a one-page business plan and a final video or slideshow for the live pitch. Tara Holmes of Kamloops This Week helped moderate the event. The most well thought out ideas consisted of a feeding system for small animals, an eco-friendly cutting board service, an ecological wooden speaker business and a painting service app attempting to improve the painting quota process. Curiously, all of the post-secondary projects at the junior dragons’ den had been pitched previously at the ICE Club’s elevator pitch competition. The “dragons” of the competition included Community Futures Thompson Country general manager Blair Gray, CFDC of CIFN (Community Futures Development Corporation of Central Interior First Nations) general manager George Casimir, KADREA (Kamloops & District Real Estate Association) president Wendy Runge, SOBE director of development Kim Torreggiani and Colin O’Leary, principal at O’Leary and Associates Ltd.
Casimir was very appreciative of everyone who contributed their time and effort to make the Dragons’ Den possible. It was a tough decision for the judges, resulting in a two-way tie for the secondary category. Congratulations to LTS Feeds (junior), Clean Kitchen (secondary), Recycled Sounds (secondary) and Quick Fix Painters (post-secondary).